Taiwan is the repository of captivating natural sceneries, such as the awe-inspiring Taroko Gorge, National Palace Museum, the tallest building of Taiwan - Taipei 101, and the highest mountain in the Northeast Asia - Yushan (Jade Mountain). Taiwan is also a paradise for gourmets to taste the varied delicate and delicious cuisines, such as local Taiwanese snacks, Hakka dishes, Chinese cuisines, and unique aboriginal foods. Gourmets may try the foods with local flavors in the night markets, and have exquisite dining in five-star hotels. Taiwan is absolutely a place that tourists may not want to miss. The National Palace Museum houses the world's largest collection of priceless Chinese art treasures, one which spans China's nearly 5,000-year history. Most of the museum's 620,000 art objects were part of the Chinese imperial collection, which began over 1,000 years ago in the early Sung dynasty. 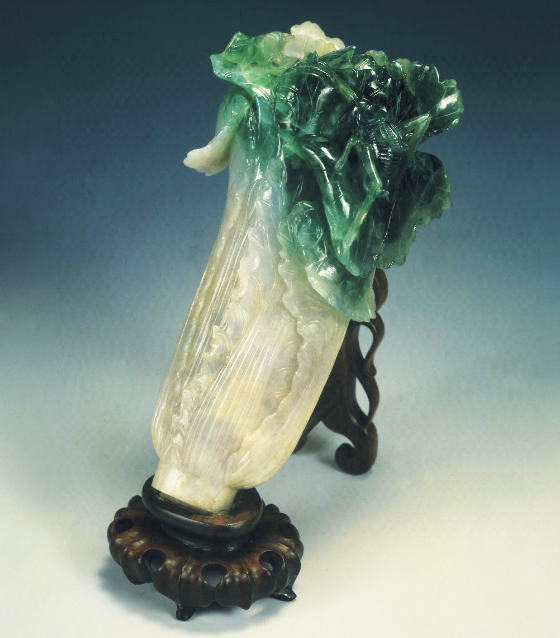 National Palace Museum is protecting and preserving the 5000-year cultural legacy of China with advanced technologies; cooperating with private connoisseurs and ushering in exhibitions from China; bringing the Museum's collection to the global community and welcoming arts of the world to the Museum. Taipei 101, with a mass of shops on the lower floors, incorporate many top brands under the LVMH group, such as Louis Vuitton, Dior, Celine, etc. The fourth floor houses the Page One bookstore from Singapore, with the highest-roofed coffee house in Taipei and many fine restaurants. The Xinyi District is the newest trend-setting commercial district in Taipei, embracing dozens of fashionable malls, restaurants, and hotels on Sections 4 and 5 of Xinyi Road. Shin Kong Mitsukoshi Department Store's New Life Square and A4 branches, Novel Hall for Performing Arts, Vie Show Cinemas, Grand Hyatt Taipei Hotel, and Taipei 101 are just a few of the many places where you can satisfy your consumer cravings in this area. 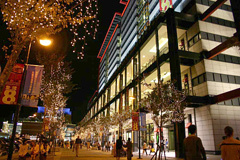 By day, the Xinyi District bustles with the fast-paced energy of business as Taipei's commercial and financial center. At night, the skyscrapers come alight with eye-catching displays of LED lights, setting the mood for evening fun. On weekends, the Xinyi District transforms again as outdoor stages and squares come alive with concerts, dance performances, record release events, and celebrity appearances, making this the place where you can experience the youthful energy of Taipei. Shaped like a pound sign, the Taipei Fine Art Museum is a traditional siheyuan courtyard with a modern edge. At night the artfully lighted museum is an eye-catching landmark. 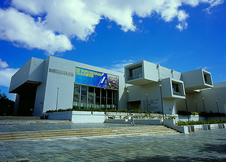 The museum hosts many international exhibitions. Built on a green hillside in 1969, the impressive National Martyrs’ Shrine was architecturally inspired by the Hall of Supreme Harmony in Beijing's Forbidden City. The shrine is dedicated to the 390,000 soldiers killed in the service of their country during the War of Resistance against Japan and the civil war between the Chinese Republican and communist forces. A major attraction at the shrine is the hourly ceremony for the changing of the honor guard in front of the main gate. 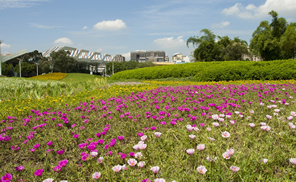 Converted from the 2010 Taipei International Flora Expo, the TAIPEI EXPO PARK is an urban recreational facility that comprises three typical park areas (Yuanshan, Taipei Fine Arts Museum and Xinsheng) while offering venues for the hosting of various events in the former Flora Expo’s pavilions. Among the iconic Flora Expo displays, still available, on the parks’ premises, mostly featuring perennial flowering/foliage plants and turfs, are the 3-dimensional Green Walls, Flower Walls, “Flora Rainbows”, Special Exhibition Area, Flower Landscape, Rare Flowers & Plants Area, and Fruit Tree Area, which aim to keep the Expo’s images and variety alive, while impressing park visitors with the openness of a vision of verdure, combined with enhanced recreational quality. 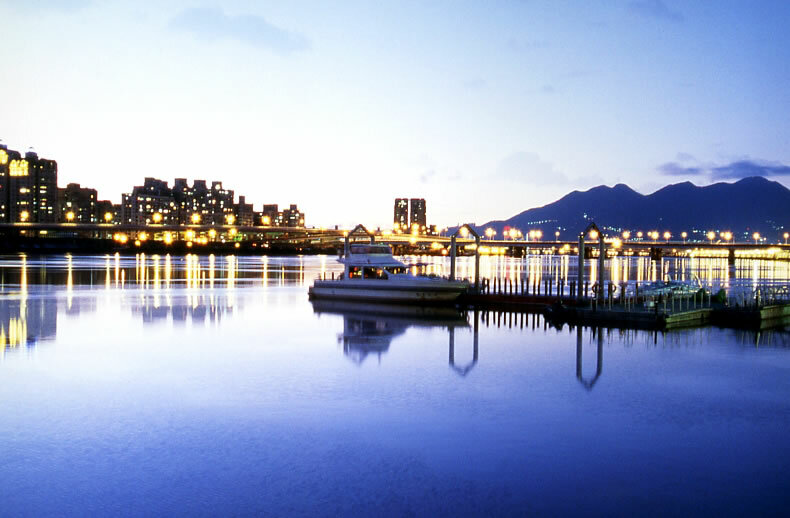 The TAIPEI EXPO PARK is also perfect for accommodating the hosting of exhibitions or other events as it lies strategically in the vicinity of MRT Yuanshan Station. 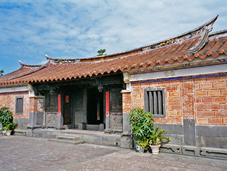 The two-century old Lin An Tai Historical Home is a southern Fujianese-style courtyard. The rocks that cover the front yard were taken from rocks that were used by mainland merchants to stabilize their ships. The pond in the front was used for defensives purposes. It also helped lower summer heat and provided water for drinking and putting out fires. Of the 14 pavilions of the 2010 Taipei International Flora Expo, the Pavilion of Dreams in Xinsheng Park Area is the only one that demonstrates state-of-the-art, interactive digital technologies originated in Taiwan. Each gallery in the pavilion is powered by advanced technologies under the auspices of Academia Sinica, in a palpable sign of national competitiveness. The pavilion’s grand hall is entitled “Prelude” to suggest the beginning of a journey involving four distinctively intriguing galleries and a theater that shows Jimmy Liao’s animated films. While visitors interact, with naked eyes, with 3D images of endemic Taiwanese plants in Gallery 1 under the theme of “Diversity”, they are transformed into insects in Gallery 2 (or “Collaboration”) and learn to coexist with flowers. The screen images magically respond to heart beats and are breath-taking in the 360-degree panoramic theater of Gallery 3 (Harmony), thanks to an Ultra Wide Band Non-contact Physiological Monitoring System. To wrap up the perfectly memorable journey, each visitor will have his/her signature flower planted in the “urban garden” of Gallery 4 (Love and Dream). The former official residence of Chiang Kai-shek and Madam Chiang maintains a quiet and attractive garden. The garden is full of plums, chrysanthemums and roses favored by the Chiang couple. Flowers bloom according to season and make for a stunning view throughout much of the year. Longshan (lungshan) Temple is a famous old temple in Taiwan. It is for worshiping Guanshiyin Budda and other divine spirits. Longshan (lungshan) Temple is facing the South. Its architecture is a three-section design in shape. There are the front hall, the rear hall and the right/left dragons protecting the middle hall. The layout is square and serene. The temple was built in Qianlong 5th year in Qing Dynasty. Due to natural disaster and damages caused by men, the temple was restored for several times. The doors, beams, and poles are beautifully decorated. There is a pair of bronze dragon poles in the front hall, four pairs of dragon poles in the middle hall. The sculptures are delicate. There are also exquisite wood sculptures. Among them, the well and Budda setting in the main hall are highly appreciated. The temple has many Chinese poems, verses and lyrics on signs. These add a touch of literature in addition to the religious and sightseeing value. There are great decorative lamp fairs and temple activities on historical festivals. On each 1st and 15th day each month of lunar year, regular visitors will come to the temple for worship ceremony. The temple attracts many people. At normal times, there are domestic/foreign tourists visiting the temple. 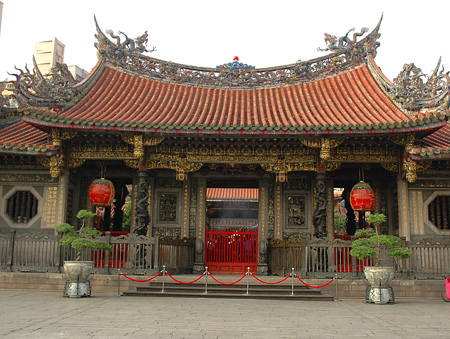 Longshan (lungshan) Temple is not only a temple, a sightseeing attraction, but also a second-degree historical site. There are traditional streets/shops, antique shops, Buddhists article shops, and Chinese medicine shops surrounding the temple. These places are great to visit due to their richness in folk art. The two-story high red brick building is shaped into an octagonal cylinder. Each side of the octagon has a dormer window and a decorative wall. During the Japanese colonial era, the Red House was turned into a venue for Peking opera and crosstalk performances in the early 20th century. The place became a movie theater in the 1970s', ushering in the beginning of Ximenting's cinema culture. 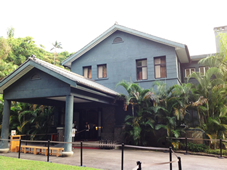 Now the Red House is both a teahouse and a venue for small-scale theater productions. Of all Taiwan’s national parks, Yangmingshan is the one located closest to a metropolitan center. Yangmingshan features a widely varying terrain, diverse ecology, and is home to numerous protected species. If you’re lucky, you might even catch a glimpse of one of Taiwan’s endemic bird species—the Formosan Blue Magpie. The park is full of plum, cherry, peach and pear trees, rhododendrons, etc. In spring, the cherry blossoms never fail to draw crowds. After cherry blossom season, about mid-March, it’s time for the calla lilies at Bamboo Lake (Zhu-zi-hu) to take center stage. Visitors go into the fields and pick calla lillies to take home with them—it’s become a must-do event for this time of a year! Perhaps one of the most distinctive features in the park is the “Flower Clock,” composed of a variety of colorful seasonal flowers. When visiting Yangmingshan, be sure to take a photo to prove you’ve seen this famous landmark! 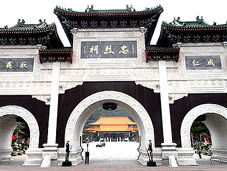 Also worth checking are popular sights like the Hsiao-you-keng (“Small Oil Pit”), Ching-tien-kang (Qing-tian Hill) Leng-shui-keng (“Cold Water Pit”), and Yangming Archive House. If you enjoy an invigorating hike, these will be right up your alley! 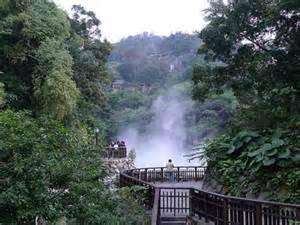 The Yangmingshan area also possesses a wealth of geothermal resources, with hot springs having differing compositions depending on their location in the park. Nearby Xing-yi Road in Beitou is lined with hot spring restaurants. If you’re passing along this way, don’t forget to take a relaxing dip in the sulfur springs! Beautiful flowers in the spring, a cool getaway in the summer, silver grass and maple leaves in the fall, hot springs in the winter—Yangmingshan’s distinctive seasonal offerings await your discovery! 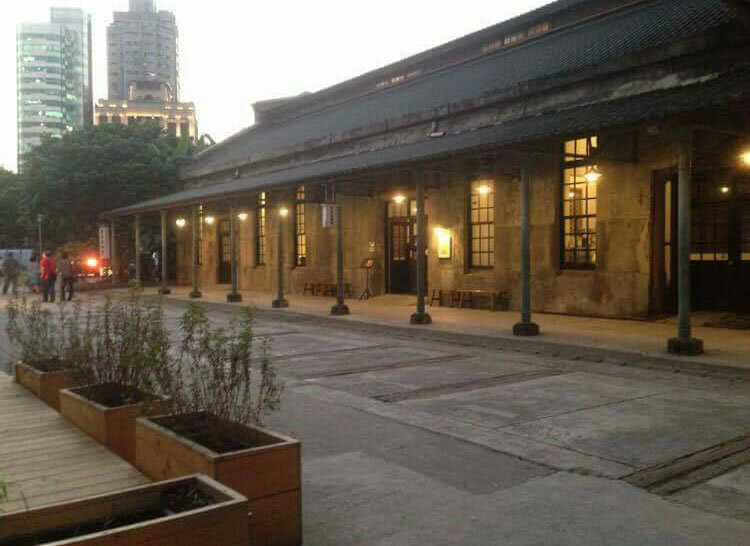 Huashan 1914 Creative Park currently serves as Taipei’s primary creative arts center. Not only is it a popular venue for a medley of performance troupes and rock bands, it also provides shop fronts that are shared by independent artisans and craftspeople. The buildings that stand in Huashan 1914 Creative Park are actually part of a Japanese-era winery that was constructed in 1914, hence the inclusion of the date in the park’s official title. By the year 1987, however, urbanization caught up with the city and the alcohol factory was relocated elsewhere to put an end to its water pollution. A decade after being abandoned, the winery was being eyed by several envious groups. Golden Bough Theatre began to use the derelict park as a performance venue and was promptly charged for misuse of government property. Nevertheless, other cultural groups soon joined in and after two years of campaigning, the ex-winery was designated a cultural hotspot in 1999. At a corner in Taipei’s high-end Xinyi District, a few low-rise houses sit closely together. These somewhat crowded buildings chronicled the tears and joy of veterans who migrated to Taiwan in the early days. 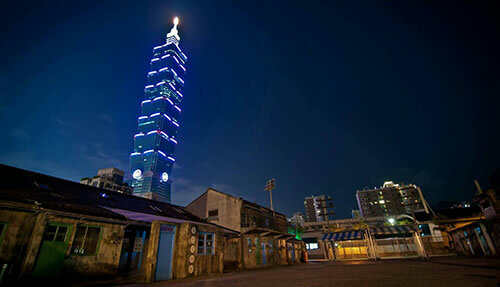 This is the former site of Taipei City’s Military Dependents’ Village, called the “Sisinan Village”. With the increasingly fast economic growth and the rising living standard, these old houses no longer serve the needs of the residents. The City Government initially planned to rebuild them in 1999. 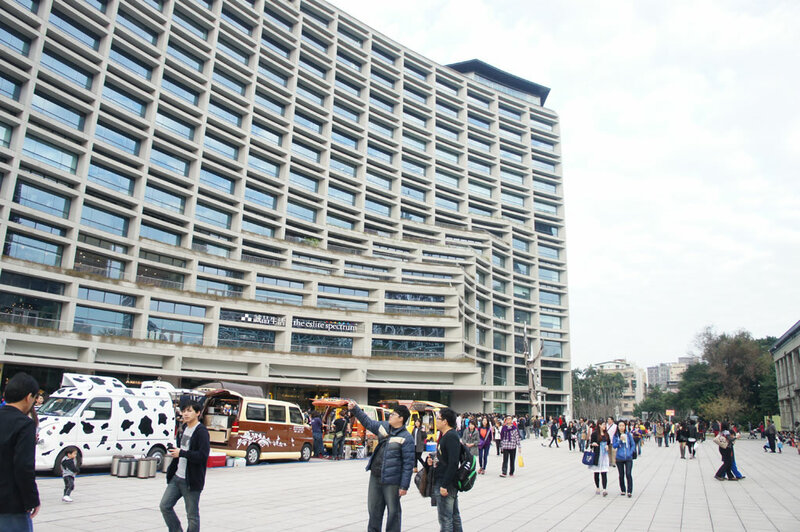 However, through persuasion from the cultural circles, the City Government designated this premise as the Cultural Hall and Cultural Park of Xinyi District, and started operation in 2003. The Hall consists of four symmetrical buildings. The houses that sat tightly next to each other have been converted into an open space for events and exhibitions. 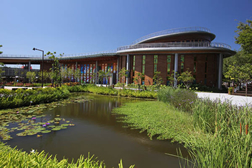 The premise now consists of an exhibition hall, Military Dependents’ Village Exhibition Hall, performance hall and community hall. The exterior still retains the unique low-rise and the simple, rustic style of the Military Dependents’ Village. The narrow alleys and footpaths will take the visitors down memory lane. It is a fascinating contrast to the neighboring towering Taipei 101 and surrounding modern buildings, a compelling testimony of Taipei’s urban development. Dadaocheng was originally settled by Pingpu people that migrated there after a fierce fight with settlers in Mengjia (current day Wanhua District) from Tongan in Fujian Province. 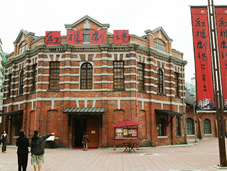 Over the years, Dadaocheng developed with shops and homes rising up along the Tamsui River. After Tamsui Port opened, Dadaocheng became the main entrepot in Taipei under the administration of Liu Ming-chuan. Yanping North Road and Guide Street were at the center of commercial activity in the district, and tea and cloth were the main items traded during this colorful and memorable time of years past in Dadaocheng. In recent years, Dadaocheng Wharf has hosted major fireworks festivals. There is also a bikeway by the wharf for riverside cycling in scenic and historic Dadaocheng. 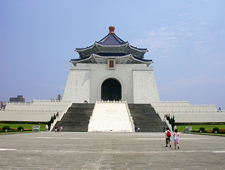 More than further information about Taiwan, please visit http://eng.taiwan.net.tw/ to discover the formosa.